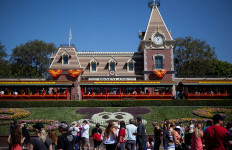 The report, prepared on behalf of a coalition of Disneyland employee unions by Occidental College and the Economic Roundtable, contends that 74 percent of workers at the theme park can’t pay for basic expenses each month and 85 percent are paid less than $15 an hour. According to the unions that commissioned it, the study — “Working for the Mouse: A Survey of Disneyland Employees” — was based on a survey of 5,000 employees of the park, which has about 30,000 workers. Disney blasted the report as a skewed survey of a small percentage of park workers, and contended it was conducted without any controls over who could respond to the questionnaire and no effort to prevent individual employees from answering the questionnaire more than once. “This inaccurate and unscientific survey was paid for by politically motivated labor unions and its results are deliberately distorted and do not reflect how the overwhelming majority of our 30,000 cast members feel about the company,” Disney spokeswoman Suzi Brown said. “While we recognize that socio-economic challenges exist for many people living in Southern California, we take pride in our employment experience,” she said. The average annual salary of full-time, hourly employees in 2017 was about $37,000, according to the company, which noted that Disneyland created more than 4,000 jobs over the last five years — more than any other business in Orange County. According to the report’s sponsors, the survey was commissioned by unions representing workers such as hair stylists, costumers, food-service workers, candy makers, security guards, ticket takers, musicians, singers and dancers.